I used to remember the days when Facebook was open strictly to college students and the only way you can sign up with Facebook was if you had a .edu email address. This then expanded to include high school students, then students and then opened up to everyone. When one looks at it from the perspective of Facebook, it all makes sense. Facebook has quickly grown to become the darling of social networking sites and has become hugely popular, more than MySpace which has become a social junkie place now. Another reason why Facebook is better than MySpace any day are the number of privacy options you have in Facebook unlike MySpace or Orkut where anyone can browse through your profile, see what your friends have to say about you, view your friends list and also view their detailed profiles. Now, in an announcement that will likely anger the privacy advocates and most of the Facebook community, Facebook has announced that it will allow users of search engines such as Google to search for Facebook members. A month from now, when anyone searches for you on Google or any other search engines, they can see a search result from Facebook with a thumbnail picture of you from your profile page. Besides this, the search result will also contain links showing you options on how you can interact with the Facebook member you just searched for. This will most likely include a link asking you to sign up at Facebook and give you an option to add that Facebook member as your friend. On September 8, 2003, the RIAA sued 261 American music fans for sharing music on Peer to Peer(P2P) networks, setting off an unprecedented legal campaign by the RIAA against its own customers. On September 8th, 2007, we will mark the fourth year anniversary of the Recording Industry Association of America’s (RIAA) legal campaign against music piracy where the RIAA has threatened, settled or filed lawsuits against more than 20,000 individuals. These individuals did not comprise of criminals or commercial music pirates but instead included children, grandparents, single mothers and a whole lot of college students, all of whom have been slapped with those thousand dollar lawsuits. The rate of these lawsuits shows no signs of slowing down but instead have increased with the most recent being the 400 lawsuits per month against college students as part of the RIAA’s new strategy against universities and college students. Inspite of all these lawsuits, music sharing over P2P networks remains as popular as ever inspite of the increasing awareness of the RIAA lawsuits. One thing seems clear from all this, suing music fans does not seem to be the solution to music piracy. 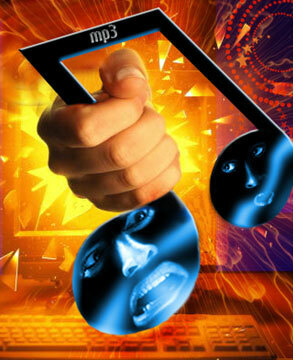 RIAA might be winning legal battles but it is losing the war on music piracy for sure. RIAA started off suing the P2P companies like Kazaa, iMesh and others. Most of these bowing to legal pressure complied by announcing “filters” in their technology. I still remember the day when SuprNova shut down… just like that one day. Even though Piratebay relaunched SuprNova, nothing can ever come close to the SuprNova of the old. The EFF has compiled a nice report called RIAA at 4 profiling the industry’s shifting legal tactics, which have familiarized campus technologists with John Doe subpoenas and pre-litigation notices. In what would later seem a prelude to the lawsuit campaign against individual file-sharers, the Recording industry in April 2003 sued four college students for developing and maintaining search engines that allowed students to search for and download files from other students on their local campus networks. The lawsuits named Joseph Nievelt, a student at Michigan Technological University; Daniel Peng, a student at Princeton University; and Aaron Sherman and Jesse Jordan, both students at Rensselaer Polytechnic Institute. The complaint principally alleged that the students were running an oncampus search engine for music, using software such as Phynd, FlatLan, and DirectConnect to search campus local area networks and index files being shared by students using the file sharing protocols included in Microsoft Windows. The complaints also alleged that the students had, themselves, downloaded infringing music. The students ultimately settled the cases for between $12,000 and $17,500 each. In Jesse Jordan’s case, the settlement amount “happens to be the same amount of money that is the total of his bank account. That is money he has saved up over the course of working three years … to save money for college.” He later stated that he did not believe he had done anything wrong and had settled to avoid the legal expenses of fighting the lawsuit. These lawsuits, the first filed against individuals for file sharing, caused an uproar, with both students and University officials expressing dismay at the heavyhanded tactics of the recording industry. At the time, it seemed hard to believe that suing individual college students would soon be not only standard operating procedure for the recording industry. 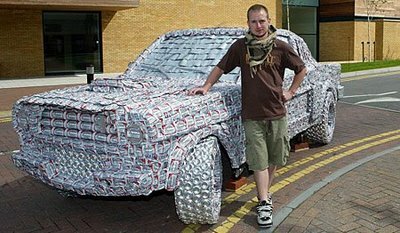 A British Student builds a life size model of his favorite car, a 1965 Ford Mustang using nothing but beer cans. This incredible feat was performed by a Jack Kirby and required almost 4000 beer cans and spread over a period of three years, reports the Daily Mirror. Jack Kirby, 23, an art & design student downed a four pack Budweiser every day. “It was hard work,” he said.